The benefit to the customer is the key metric. 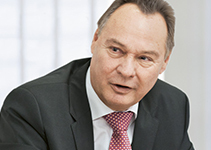 Ulrich Hurni, one of the core messages of the vision is connecting the physical and digital worlds. What does this mean for PostMail and Swiss Post's letter business? Ulrich Hurni: The physical letter will continue to be important in the future. However, we do have to link the advantages of the letter in terms of impact even more closely to the flexibility and speed of digital channels. This might be through simplified access to our established services on the Internet, new and surprising product features, or through designing integrated solutions with which we can cover the varying communication needs of our customers from a single source. Do you have a concrete example? One example is E-Post Office, the intelligent online letter box that offers recipients a central platform with which they can determine how they want to receive mail from different senders, choosing between physical or digital delivery. 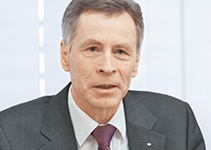 Franz Huber, what does the vision stand for from your perspective as Head of Post Offices & Sales? 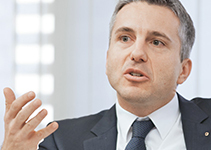 Franz Huber: For us, the central focus is on the customer. Customers today expect Swiss Post to come to them, not the other way round. In the past few years, we have developed services that are time- and location-independent. Our aim is simply to make life easier, whether it's with the My Post 24 terminals, the SMS postage stamp, mobile banking or the home delivery service. What does the vision of “Simple yet systematic” mean for the post office network of the future? A physical point of sale will still be physical in the future. But we can add value to the point of sale and flesh it out with additional content by turning it into a hub for the chain of multi-faceted services. Our understanding and development of the Swiss Post network in the future will be broader, with a wide range of customer access points which in addition to post offices, agencies and the home delivery service, also include parcel terminals, PickPost points, PostFinance branches, letter boxes and online access. 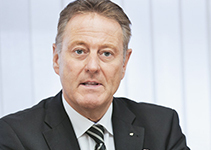 Jörg Vollmer, how is Swiss Post Solutions putting the new vision into practice? 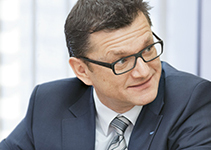 Jörg Vollmer: For us, our common vision of “Simple yet systematic” is a very natural and integral part of our core processes. The essential point is that it puts the central focus on our customers. If they are satisfied, they will renew contracts and recommend us to others. For the 7,700 or so Swiss Post Solutions employees in more than 20 countries, this customer focus is also a compulsory benchmark from now on. In our document solutions, we also combine the physical and digital worlds. Linking the physical and digital worlds to each other: is that not part of day-to-day business for Swiss Post Solutions anyway? In their core businesses, and given the digital transformation, our customers are facing enormous challenges. New possibilities such as paperless offices and the latest methods for automating business processes or data analysis can often not yet be exploited to their full potential. We can help with that! With our solutions, we connect the physical and digital worlds, making it easier for our customers to operate in a complex environment, giving them improved efficiency and greater flexibility so that they can focus more clearly on their own customers and value-generating activities. 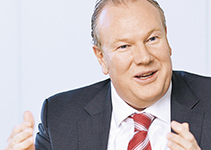 Dieter Bambauer, you at PostLogistics are the main drivers when it comes to e-commerce. “Simple yet systematic” – what implications does that have for your unit? Dieter Bambauer: A system is made up of various components that complement each other perfectly and interact flawlessly. For us, these are the products and services. Combined meaningfully, they offer customers added value: for online retailers, for example, Swiss Post offers a customer login that takes care of address management for them. Recipient customers can use it to log in to various online shops and only have to enter their login information and delivery addresses once. In 2016, Swiss Post will also launch individual management of parcels and registered letters. Have you not already achieved the vision in e-commerce? There is no reason to sit back and relax. Although e-commerce is one of the first examples to illustrate the idea of our vision, we are also only beginning to convey the core concept to our customers and make it tangible for them. And this is exactly the ambition of this vision: to increasingly operate on the market as a provider of integrated solutions, in addition to our primary products. What's the situation at PostBus, Daniel Landolf? Is it possible to make transactions and customer solutions simpler than in the past? Daniel Landolf: That's the question we ask about all customer solutions! Simplicity has always been a high priority for PostBus: after all, who doesn't want to travel from A to B as simply as possible? But behind the services, which are simple for our passengers, there are generally complex processes that we develop continually. Mobility requirements are increasing steadily, passenger expectations are rising, competitive pressure is growing: how can the vision help PostBus to overcome these challenges? We realize that PostBus has to offer more than simply transporting people from A to B. The “product” is not in fact a single route, it's an entire journey that is often taken using various means of transport. The mobility chain must therefore always be considered as a whole, which is why we now also offer solutions such as the bike sharing service PubliBike or, in some regions, the mobility sharing network PubliRide. With our testing of autonomous buses, we want to find out how and where these intelligent vehicles and new forms of mobility might be used, whether in areas that are not currently served by public transport or in congested cities with a new city concept. In everything we do, we want to make it as simple as possible for our passengers, for example with the ability to purchase a bus ticket by SMS, or with e-ticket systems such as “Check in, Be out”, which calculates journeys automatically using WiFi and your smartphone. 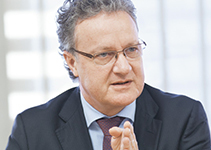 Hansruedi Köng, what does simplicity mean for PostFinance? Hansruedi Köng: We want to help our customers manage their money as easily as possible, and we want each contact with PostFinance to lead to a positive customer experience. But being simple for our customers does not automatically mean that our internal processes are also simple. That's something we need to work on. How do you make things simple for PostFinance customers? With solutions that we tailor consistently to their requirements. One example is the new e-finance, with a clearly laid out user interface that makes it more intuitive to use. Another is the Express withdrawal at Postomats, where customers can withdraw the amount they want at the touch of a button. Or TWINT, the digital wallet with which PostFinance makes payment with your smartphone possible. Pascal Koradi, does the vision also have implications for you as Head of Finance? Pascal Koradi: With the new vision, the company has redefined the strategic guiding star. The focus is ambitious: Swiss Post maintains market-based, complex systems that are easy to use and add value for its customers. In our role as Finance managers, it is our job to ensure the “manageability” of the Group as a whole on the path that we have chosen. The vision has been broken down into specific market-based guiding principles for the managerial units. On this basis, the Finance unit will review the strategy to be derived from those principles. In this process, the optimization of the reporting and control systems for the collection, analysis and aggregation of relevant data across the Group is a high priority. Yves-André Jeandupeux, one of the challenges you face as Head of Human Resources is to make employees fit for the future. Does the new vision help you with this? Yves-André Jeandupeux: The new working environment must be designed for and with employees to ensure that systems are available to them that allow efficient work practices and that at the same time are also motivating. A good example of this is PostConnect, our internal online collaboration platform, which simplifies exchange and collaboration. And we also deal with issues such as how to recruit and retain the employees we need to implement Swiss Post's vision? What does this mean for managers? In response, we are currently developing what we call the leadership compass. Each of the Swiss Post units works with the principles of leadership and cooperation, with guiding principles – and with the new vision. How do you as Head of Human Resources ensure that all of these aspects are complementary? We certainly have the potential to simplify things further. The vision, guiding principles, strategies and policies are important tools, both for managing Swiss Post and for developing its culture. We need to be faster and more flexible. This calls for qualified employees and a corporate culture that encourages innovation, but also allows for mistakes from which we can learn and be successful the next time. In the future, we want to surprise our customers with services that are even simpler. Customers expect Swiss Post to come to them. The vision is an integral part of our core processes. We bundle products and services into integrated solutions. PostBus has to offer more than simply carrying people from A to B. It's not easy to be simple. In the Finance unit, we ensure the manageability of the Group as a whole. We need to be faster and more flexible.